Joan Field was an American violinist born (in Long Branch, New Jersey) on April 28, 1915 (Heifetz was 14 years old and would live an additional 72 years.) 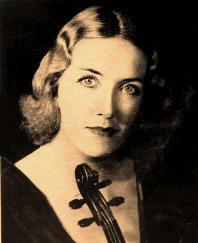 She is a very rare example of an American concert violinist who never attended an American music school, although she studied privately with Albert Spalding (teacher at Boston College), Franz Kneisel (teacher at Juilliard), and Michel Piastro (Concertmaster of the NBC Symphony under Toscanini and the New York Philharmonic under Rodzinski.) (In fact, Nicolo Paganini, Zino Francescatti, and Alexander Markov never formally attended a conservatory either. For the record, neither did Daniel Barenboim.) She began violin studies at the age of 5. One source states that her earliest teacher was pianist Andre Benoist, whom, it is said, discovered her. From age 10, in Europe (Paris, France), she studied with Jacques Thibaud and George Enesco, among others. At age 14, she returned from Europe (1929) and continued her studies, most likely with her former teachers. Her debut in Town Hall in New York City took place five years later, in 1934. She was 19 years old. Benoist was her accompanist, accompanist also of Jascha Heifetz, Pablo Casals, and Albert Spalding. The program included the violin concerto of Ernst von Dohnanyi (Opus 27 in d minor), a seldom-performed work. The review of the performance (in the New York Times) stated that "Miss Field's playing is that of a thoughtful, sensitive, and fastidious musician." From that point forward she regularly concertized and recorded, in the U.S. and in Europe, playing with all of the major orchestras. In 1937, she played at the White House, hosted by President Franklin Roosevelt and First Lady Eleanor Roosevelt. She first soloed with the New York Philharmonic in Carnegie Hall on March 25, 1939, playing Wieniawski’s second concerto. In 1944, she began a successful radio career at WQXR in New York (the same station which violinist Eddy Brown helped found in 1930), eventually writing, producing, and performing in more than 200 weekly programs. She premiered the violin concerto of prodigious (though unknown) composer Mana-Zucca (Augusta Zuckerman) which was probably written for her. Eddy Brown later recorded the concerto. Field also premiered Sergei Prokofiev’s second violin sonata in the U.S. She was the first to record Charles Ives’ first violin sonata (1951) as well – she had already been playing his violin works for some time. Her playing (for an October, 1948 Town Hall recital) was described as being “uncommonly satisfying.” Coming from a professional New York music critic, that wording is itself very uncommon and an exceedingly high compliment. Decca signed her to a recording contract in 1958 and one of the first works recorded by her for this label was Spohr’s eighth violin concerto - she was only the third violinist to record the work. (Georg Kulenkampff was the first to record it, in 1935, and Heifetz was the second, in 1951.) One of her rare recordings – now out of print - can be found here. Although YouTube has no videos of her playing, a Facebook fan page can be found here. Until 1968, Field played the Joseph Joachim Stradivarius violin (1698) which is now in Geneva, Switzerland. She retired (in Florida) in 1965, at age 50. (Iso Briselli retired from the concert stage at age 35. On the other hand, at age 89, Ivry Gitlis is still giving concerts.) Joan Field died in Miami Beach on March 18, 1988, at age 72. As far as I know, she only taught privately. Thank you for that lovely tribute, Robert. Was that chamber music session in Miami? And what year was it? I'm Joan Field's second son. My brother Charles also went to Juilliard in its original home during the 1960s. Conrad - sorry to be so long in replying to your post, just seeing it today. Very interesting to read about the old violin. There's no way of course to know whether or not it belonging to my mother... unfortunately. I'm happy to answer any more questions about her you might have. Thanks for your post and your interest in her.